Join me and a lovely bunch of coconuts for 7QT over at Conversion Diary, hosted by Jennifer! 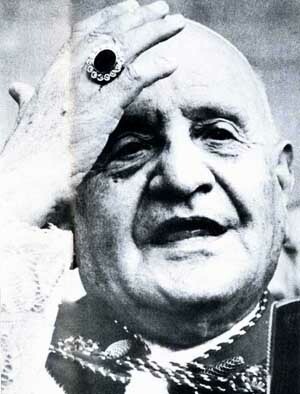 It’s October 11, the feast of Blessed Pope John XXIII! In our current day and age, the secular world is hailing Pope Francis for not wearing the red shoes, moving out of the papal apartments and so on, because to them that’s humble. Now, nothing against Pope Francis here, but I also see the humility in wearing the heavy jewels, the heavy crown, and the blood-red shoes. Being the pope is a weight, man, one that (almost) all of them died wearing. John XXIII lived that weight, and he lived it for love of Christ and love of us. But nothing helps us carry the weight of our world better than humor does. So, in honor of this feast day, I’m going to post seven of my favorite John XXIII quotes, most of which will make you giggle. He sure was a hoot!